His holiness the 14th Dalai Lama is the current Dalai Lama. 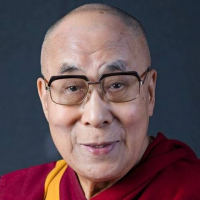 Dalai Lamas are important monks of the Gelug school, the newest school of Tibetan Buddhism which is formally headed by the Ganden Tripas.He received the Nobel Peace Prize in 1989. He has traveled the world and has spoken about the welfare of Tibetans, environment, economics, women's rights, non-violence, interfaith dialogue, physics, astronomy, Buddhism and science, cognitive neuroscience, reproductive health, and sexuality, along with various topics of Mahayana and Vajrayana Buddhist teachings.